True picture of the planet Mercury. Mercury is the smallest planet in our solar system and it is the closest planet to the Sun. Mercury was named after the Roman god “Mercury” which is comparable to the Greek god called “Hermes”. 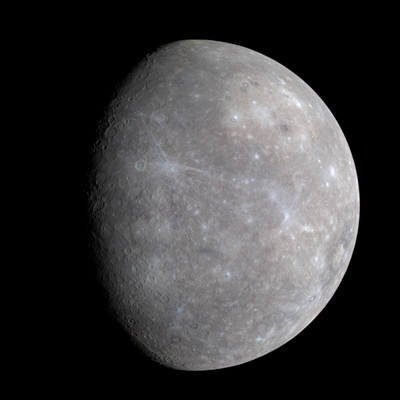 Astronomers were known to have first observed Mercury from as early as the 1st century BC, although even now little is known about Mercury as a planet. 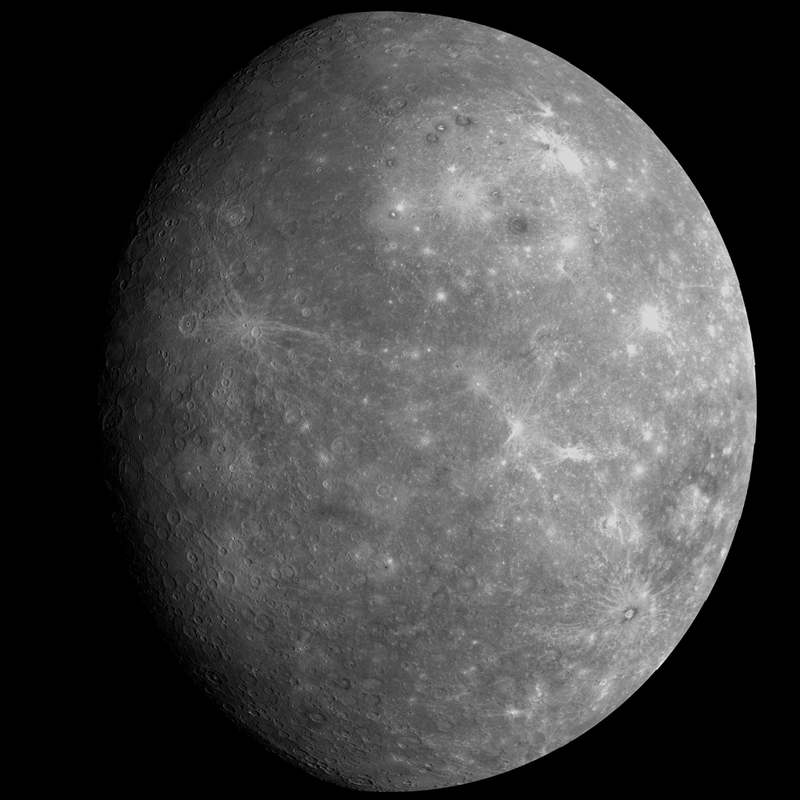 Ground based telescopes do not reveal much detail about the surface of the planet and only two spacecraft missions have been sent to observe Mercury. The first called Mariner 10 mapped 45% of the planet’s surface between the years 1974 – 1975 and the second spacecraft, Messenger, began further mapping in 2011. Let’s find out some more detailed facts about Mercury. Mercury is roughly the same size as the Earth’s moon and about two fifths the size of the Earth. Mercury does not have any moons. It is estimated that Mercury was formed 4.6 billion years ago. Mercury was first viewed through a telescope in the early 17th century by Galileo. With Mercury being the closest planet to the Sun it can reach a surface temperature of approximately 427 degrees Celsius, but where the Sun cannot reach Mercury the temperature can be as low as -180 degrees Celsius. Mercury is approximately 46 million kilometres to 70 million kilometres from the Sun. The surface of Mercury is quite similar to that of the Moon. The planet has been heavily bombarded by asteroids and comets over millions of years. The largest known crater is known as Beethoven and is 643 km in diameter – this is thought to be the largest in the solar system. 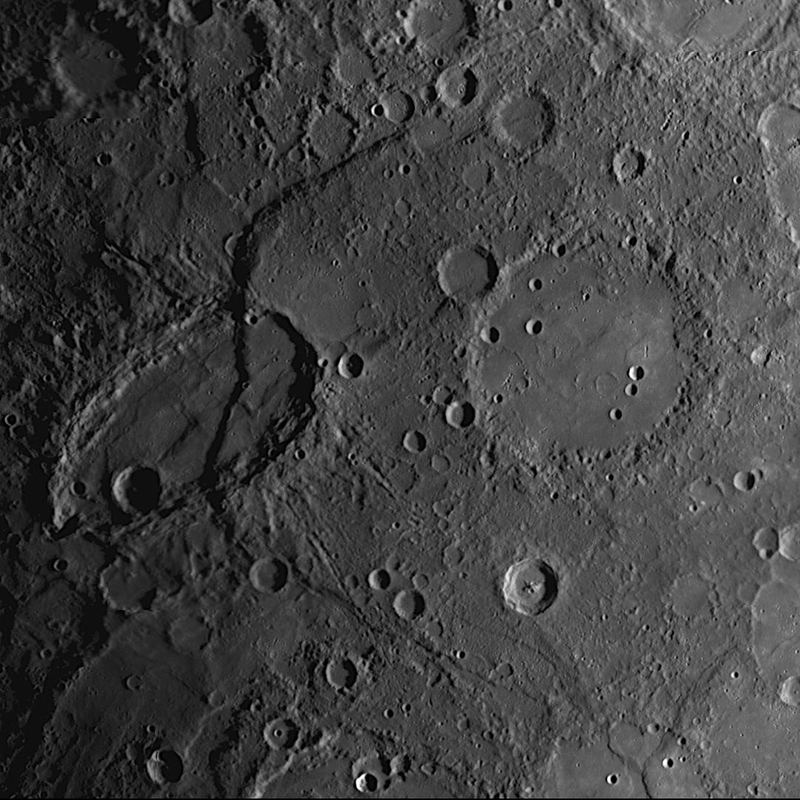 Mercury also has the Caloris Basin which at 1300 km in diameter is believed to have been caused by impact with an object that was over 100 km in diameter! Craters on the surface of Mercury. Mercury completes one full orbit of the Sun every 87.969 Earth days but takes 58 Earth days to rotate just once. This means that on Mercury one of our Earth years takes just a day and a half on Mercury. Mercury can sometimes be seen with your own eyes with no need for a telescope. Because Mercury can be seen with the naked eye the planet has become part of ancient folklore and mythology in most civilisations over the years. The earliest known recorded observations of Mercury were by an Assyrian astronomer in approximately the 14th century BC in the Mul.Apin Babylonian tablets. Mercury is the second densest planet in the solar system (second to Earth) and it is made mainly from Iron (70%) with the remaining 30% composed of Silicate material. Mercury’s core makes up about 42% of the planets volume with the mantle being 500 – 700 km think and the crust just 100 -300 km thick. Mercury is one of four planets known as “terrestrial planets”. Terrestrial planets are the four planets that are closest to the Sun and are characterised as being made mainly from silicate rocks and/or metals. Terrestrial planets such as Mercury are different from “gas giant” planets such as Jupiter which may not have solid surfaces. The four terrestrial planets are Mercury, Venus, Earth and Mars. Mercury is too small and hot for its gravity to sustain an atmosphere over long periods of time. Despite the small size of the planet, according to data sent by the Marriner 10 spacecraft when it observed Mercury, it is understood that the planet has a strong magnetic field – at least as strong as Earth’s. 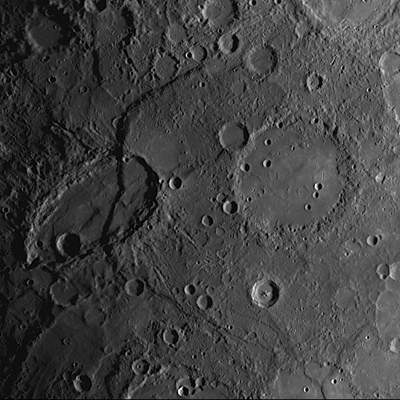 Mercury has the most eccentric orbit pattern of any planet in our solar system. An eccentric orbit means that it does not orbit in a perfect circle. This means that Mercury can be anything from 46 million kilometres to 70 million kilometres away from the Sun depending on its current orbital location. 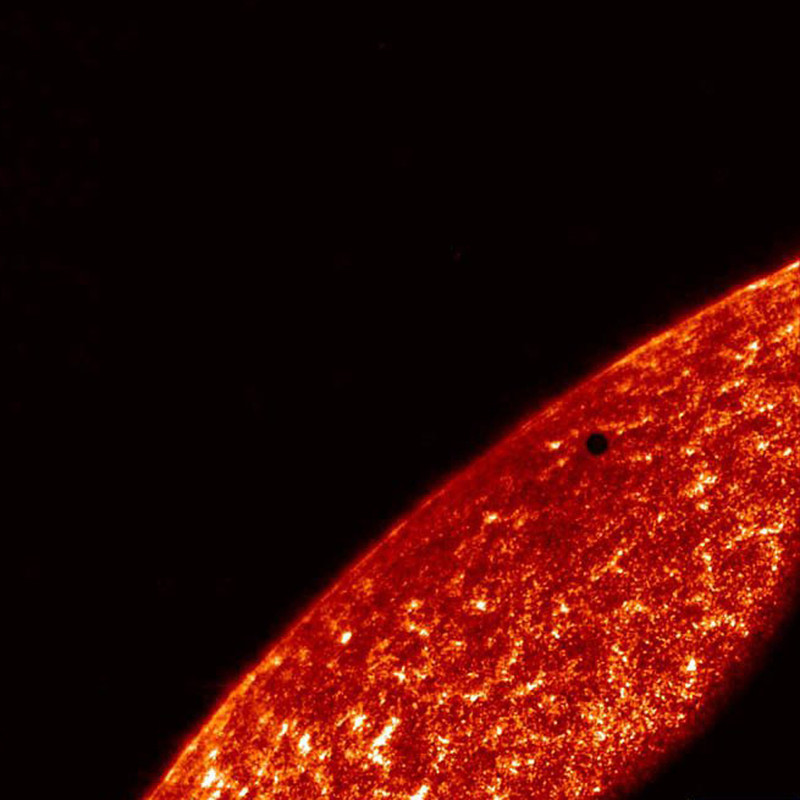 Mercury can be observed from earth passing in front of the sun approximately once every 13 years (see 3rd picture) and it is so small that it couldn’t be seen from earth before the invention of the telescope. The picture gives you some idea of just how small mercury is compared to the sun! The time it takes from sunrise to sunset on Mercury is 176 Earth days. Even though the temperature on Mercury can be as high as 427 °C on the surface, there is still ice! This is because the planet has frozen poles in a similar way to the Earth. The icy poles exist because they are in permanent shadow due to the low position of the Sun.